When it comes time to repower the industrial equipment that’s key to getting work done on your job sites every day, often you have only limited options. For equipment powered by engines up to 140 hp, Perkins Pacific recently launched a new option that can give your equipment a second life and offers an alternative to new Tier 4 Final engines or remanufactured engines. New plug-and-play replacement engines known as Industrial Open Power Units (IOPUs) are brand new engines designed specifically for equipment repowers and can replace many engine brands. These engines feature a compact design with multiple build configurations to fit into highly specialized industrial equipment used on many oil rigs, ports and fracking operations. One of the biggest concerns with any equipment repower is downtime for engineering and integration, and the IOPUs are engineered with an innovative rapid-replacement design that typically shaves a significant number of hours off of a repower. The engines’ Tier 3 rating also allows each piece of equipment to retain its existing fuel tanks, reducing repower costs. Perkins Pacific, a master Perkins engine distributor with several decades of equipment repowering experience is the new national provider for these engines which are designed and manufactured by Perkins at a state-of-the-art facility in Seguin, Texas. 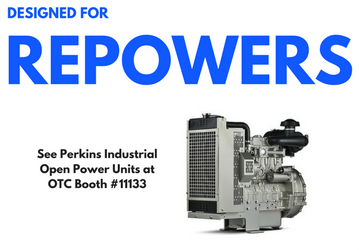 To learn more about replacement IOPUs, visit Perkins Pacific at OTC in Houston, Texas on May 1-4 at booth 11133.